Story centers on a battle during China's Warring States Period, a series of civil wars, which spanned from the 5th to the 3rd century B.C. Based on a popular Japanese manga, which was in turn based a Japanese novel inspired by Warring States history in China. China's Sherlock Holmes returns in an epic adventure where East meets West. 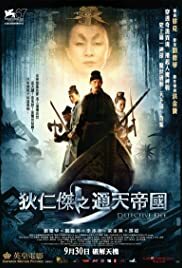 Detective Dee and his entourage team up with a crew of Viking warriors to uncover the mystery of China's imperial bloodline and the mysterious lost city of Ivy. Empress Wu Zetian: Remember, when one's aim is to achieve greatness... everyone is expendable. 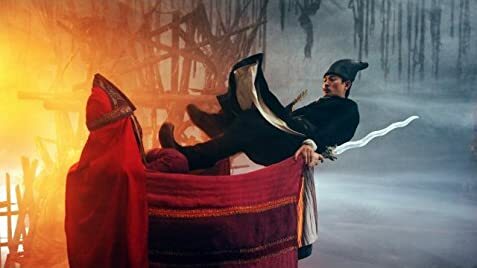 It had been a while since I had seen a Tsui Hark movie. I now feel remiss in not better keeping up with his career. Detective Dee is fantastic! The visuals are stunning. The sweeping, epic scenery and the HUGE set pieces transported me fully into the era of the Tang Dynasty. I was impressed by the CGI, often having trouble distinguishing where the real, physical parts of the set ended and the computer generated world began. The cinematography is superb. The story was complex but still digestible. The filmmakers threw up enough red herrings to keep me guessing while making it believable that Detective Dee could solve the case without huge leaps in logic. I found Andy Lau's performance effective, but was particularly impressed by Carina Lau who played Empress Wu. Her performance was both subtle and powerful. She was mesmerizing anytime she was on screen. As for the fight scenes, well... wow. I mean, really, WOW! The complexity of the final fight between Dee and the person he figures out committed the crime made fight scenes in the Bourne series look like child's play. Seriously. Now, there was wire work - I know some people really dislike that stuff in Kung Fu style movies, but it really worked in this setting. I hope people will give this one a chance. I really thought Detective Dee was fantastic!